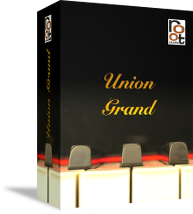 We're happy to provide the Union Grand to you as a free download. All you need to do is to like root-sounds on facebook and sign up for our newsletter (if you don't hear from us, make sure you didn't uncheck the newsletter). Already liked root-sounds on facebook? Just let us know. By submitting this form, you agree to sign up for our mailing list. Please allow a couple of work days to receive your download info. No spam, no unauthorized use of your email address! You will only hear from us when we introduce new products or special offers.